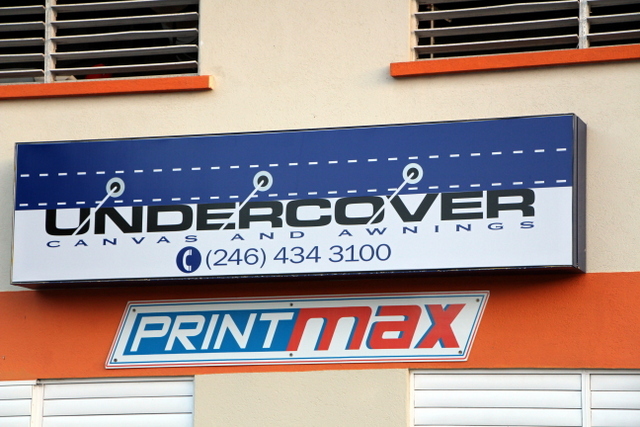 Undercover Canvas is Barbados’ premiere awning and canvas shop. 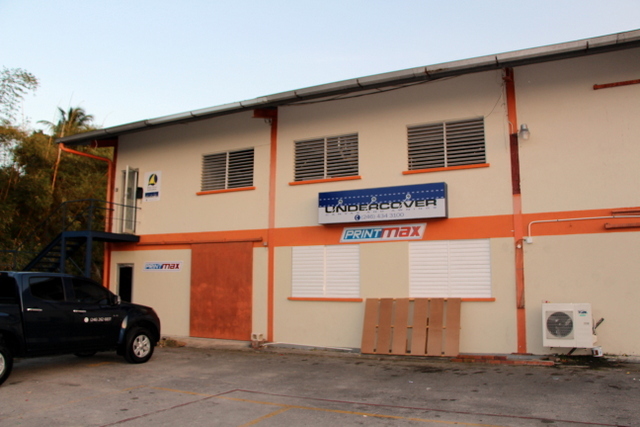 Owner and founder, Nigel Richings, has been patiently waiting since 2006 to automate his shop. Now that he finally has his Carlson Plotter/Cutter he CAN’T WAIT to show up in the morning, ready to take on bigger and more impressive projects than ever before! 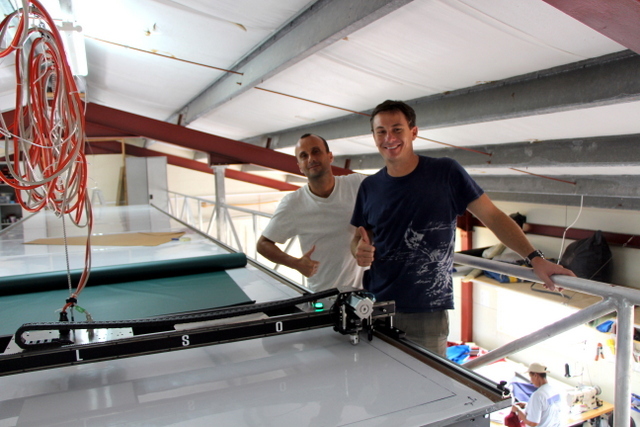 Nigel, and his Brother Paul, give a big thumbs up with Undercover’s new Carlson plotter/cutter! 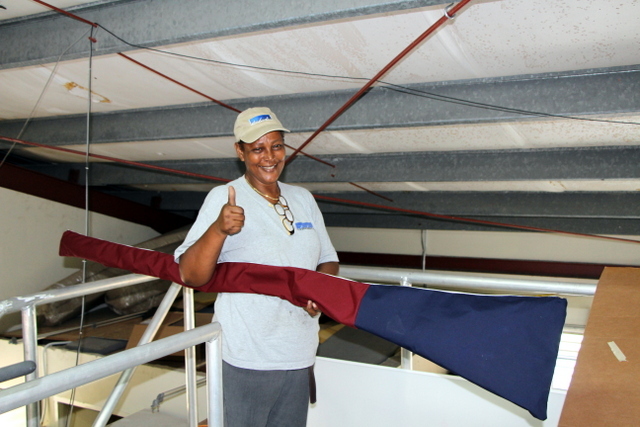 Nigel started in canvas at Doyle Sails when he was 15 years old. 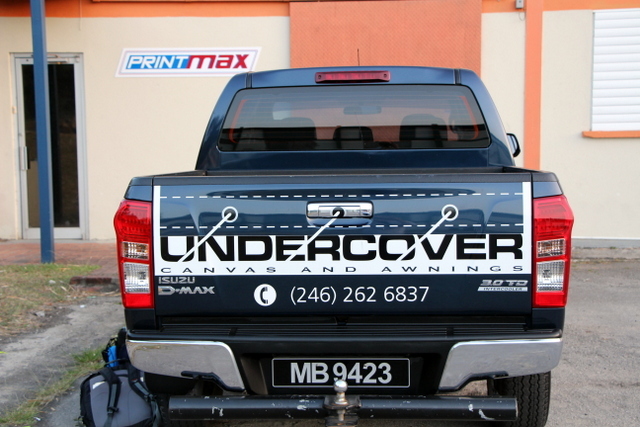 By the time he was in his mid 20’s, he was running his own canvas shop out of his garage and after-hours from the loft, “under cover” (hence the name). When he needed more space than the two saw horses in his garage shop, he would move to the living room to pound grommets. Not great for his roomate and brother trying to sleep in the next room! Eventually he bought a small singer and moved into his own space and Undercover Canvas was born. He now has distinct branding, four trucks, and installations all over the world, including several recent projects in New York City. Despite his growth, Nigel was still looking to automate and improve his processes — “We needed something to take us to the next level. This (the Carlson cutter) is it!”. Four trucks. This is no longer fly-by-night! And no longer working out of the garage! 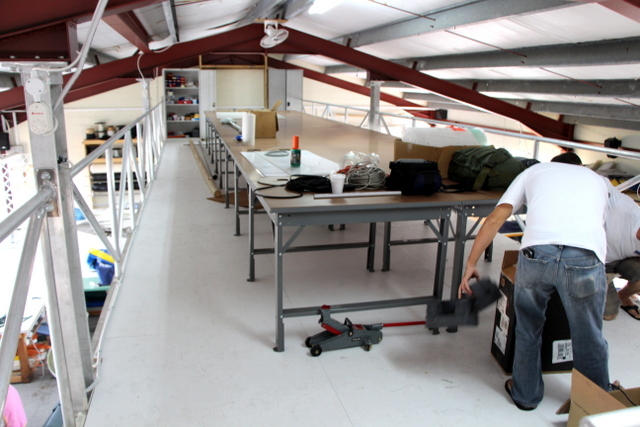 Growing pains abounding and short on space, Nigel was inspired by a sailmaker’s tendency to “loft” their tables. 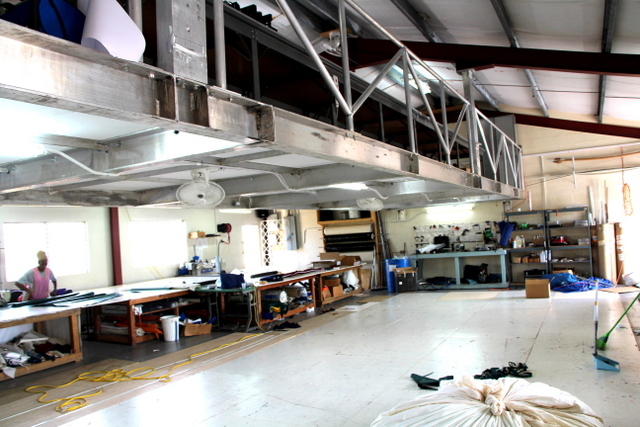 Using custom aluminum beams, they dropped a loft from his ceiling to add square footage to the shop. Lofting a table is a great way to add space, without moving or expanding your building’s foot print. The aluminum frame is light, sturdy, and surprisingly affordable. 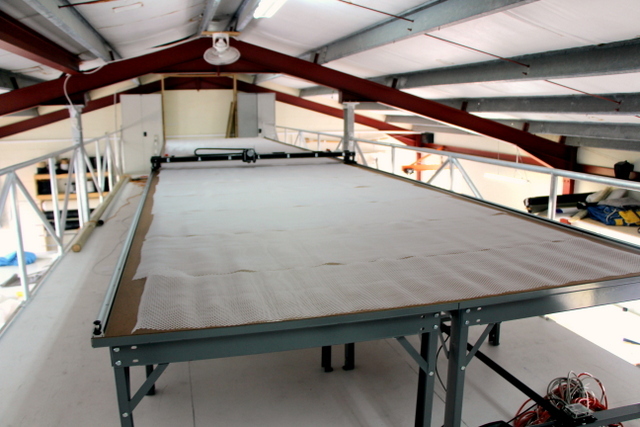 The loft is big enough for a 7’x32′ plotter/cutter system and vacuum table. They are also keeping all valuable hardware up here in locked cabinets. If you aren’t running the cutter you shouldn’t be up here! Nigel admired how his old bosses at the sail loft utilized technology to give them a competitive advantage. 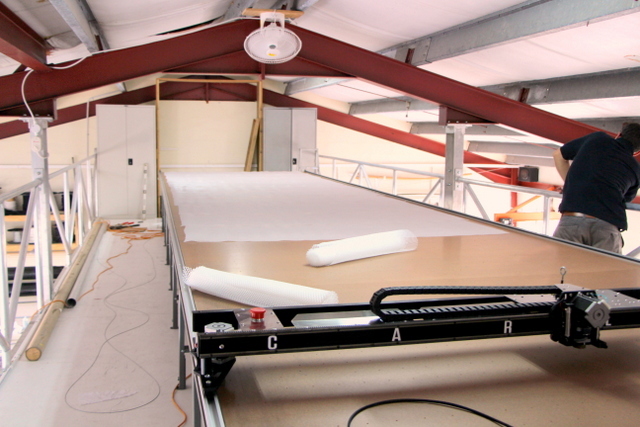 With growing demand for his signature awnings, custom resort patio cushions, and the all-too-familiar pressure of a former employee-turned-competitor, he decided it was time to take his shop to the next level (literally) with a Carlson Design plotter/cutter and Digitizer. Nigel needed to cover a fountain he had measured earlier the morning of the install. 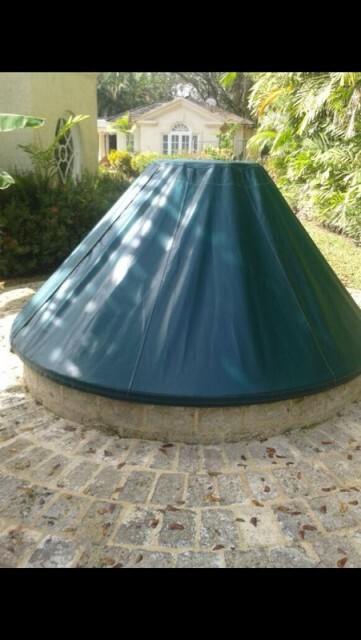 He took the circumference of the base, top, and the height of the fountain. 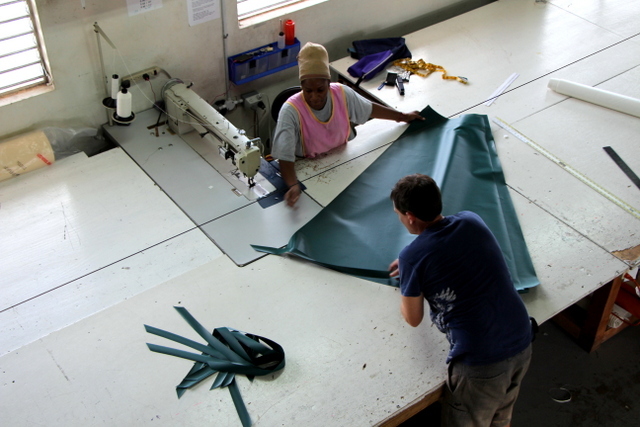 We turned these measurements into a flat, 2D pattern that was broken and seamed to fit on 60″ wide Weblon material. Nigel measured the fountain at the customers house. Diameter 1, Diameter 2, and height. The unusual shape of this cover and the custom customer demands make it difficult to design a “cone” unfolding program that would produce a finished pattern. For this reason, we don’t like our customers to rely on custom programs for basic design — especially not when getting started. It can severely limit creativity and learning. 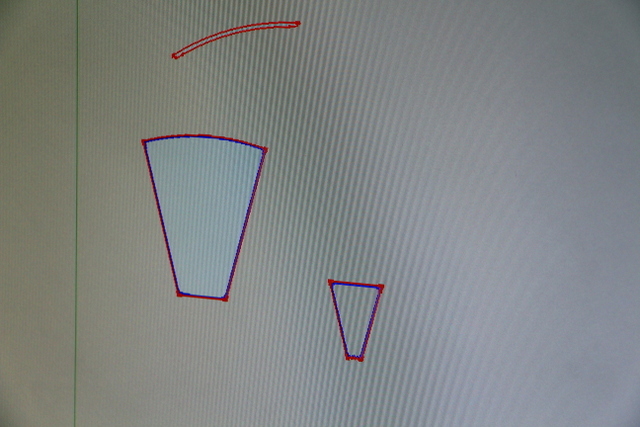 We do, however, have a basic boot/cone making program with inputs for Circumference 1, Circumference 2, and Width. Import this *UC pattern into Sketchup to modify. You can also find great pattering resources online for additional reference. 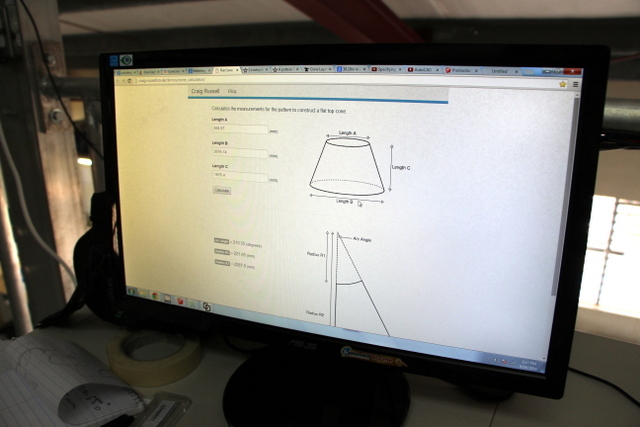 We used a website on cone design to help explain how a cone is flattened into a 2D shape. Sketchup is a free CAD program that is very easy to learn and use. To make it even easier, we developed a 2D tool bar Sketchup plug-in to help you quickly draw plot (blue) and cut (red) lines. It also outputs a ready-to-cut file — all you have to do is click “save”! 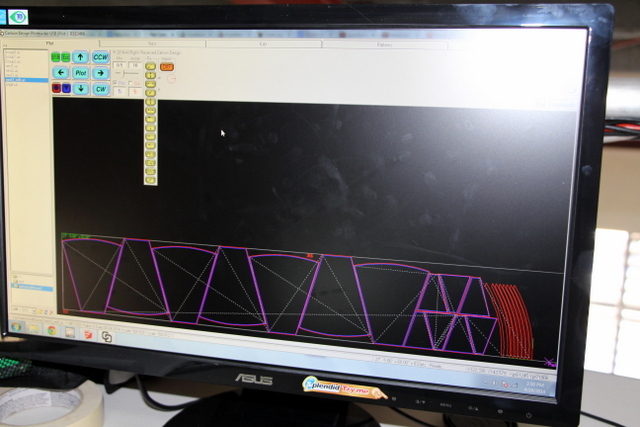 Drawing the pattern in Sketchup is easy. The hard part is understanding WHAT and WHY you are drawing. 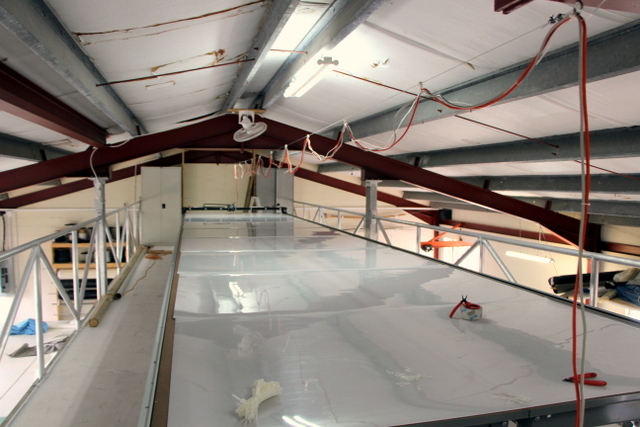 To begin, we needed to break the 2D cone into 7 sections so it would nest on our 60″ wide material. We drew a large 2D unfolded cone and broke it into 7 parts. These seven parts were cut in two to nest across the width of the fabric. Sketchup makes grouping and exporting multiple, ready-to-nest files very easy. Exploded sections include: seven middle sections, seven top sections, and eight perimeter strips so seams don’t overlap. Nested parts, ready to cut. 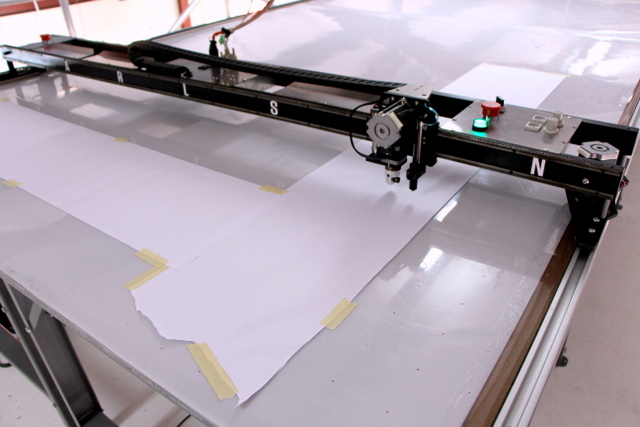 The dashed line is where the plotter/cutter will traverse to cut the next panel. Run the “Quick Optimizer” to select the quickest cutting path. 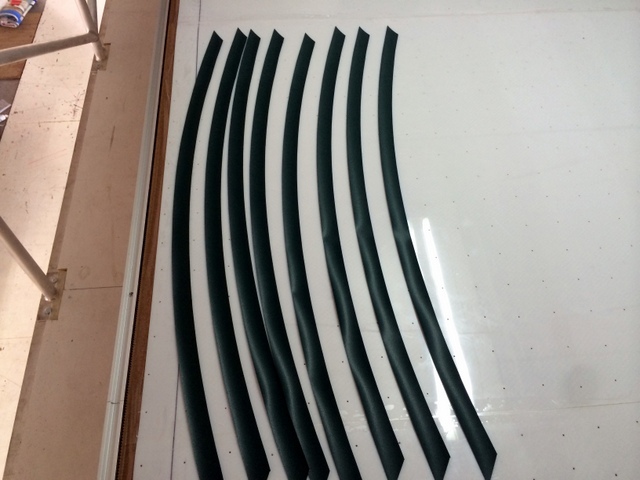 These parts were exported, nested, and cut in 10 minutes. This job would have normally taken two guys at least a day to draw. Parts combine are are welded together. Extra strips (which cut quick and easily to shape!) are added in a staggered layout. Parts checked for size and sewn. Nigel sent us this finished picture a few days after we left. Great first project. Unlike traditional geometic shapes, custom covers and unusual shapes can be very difficult to draw on the computer. 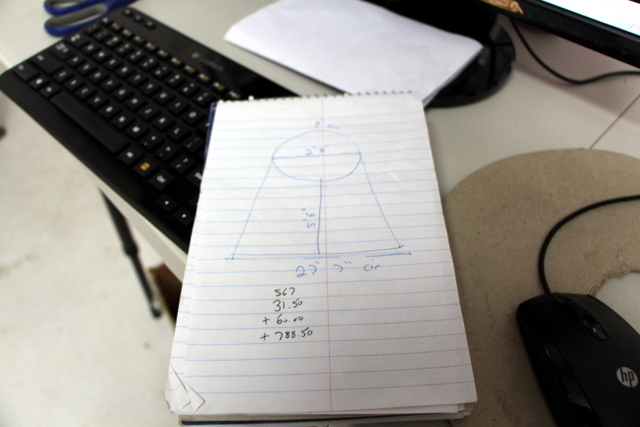 That’s why we developed the T-Bar Pattern Digitizer to make tracing/digitizing custom patterns quick and easy. Simply move the laser pointer around the pattern and record significant plot and cut points. 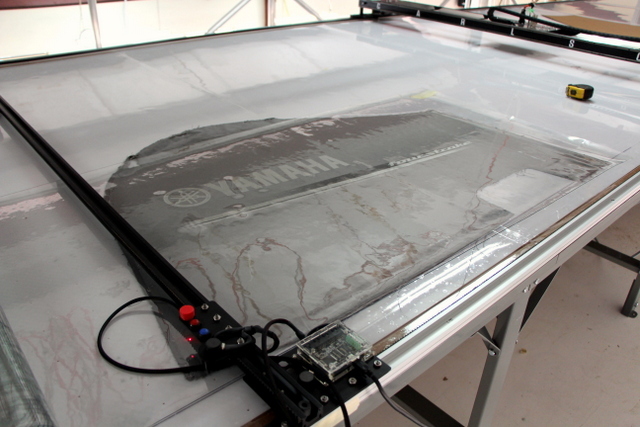 The first pattern we digitized was an old four-piece Yamaha motor cover. Lay the patterns out flat. To avoid taping old patterns, try covering them with a thin mil plastic, urethane, lexan, plexi, etc. During digitizing, it is important your pattern does not shift. Move the laser pointer over significant points on the pattern and use the red button to record cut lines and the blue button to record plot lines. 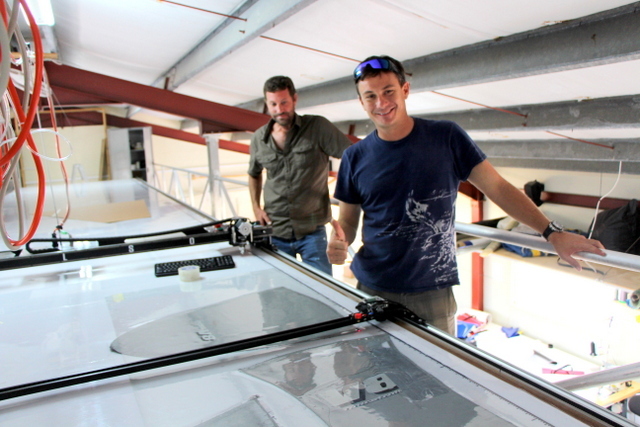 Nigel and Tony give a thumbs up with the T-Bar! On the weekend, we headed into the field to take measurements at a local Sushi restaurant that recently purchased a Signature Awning. 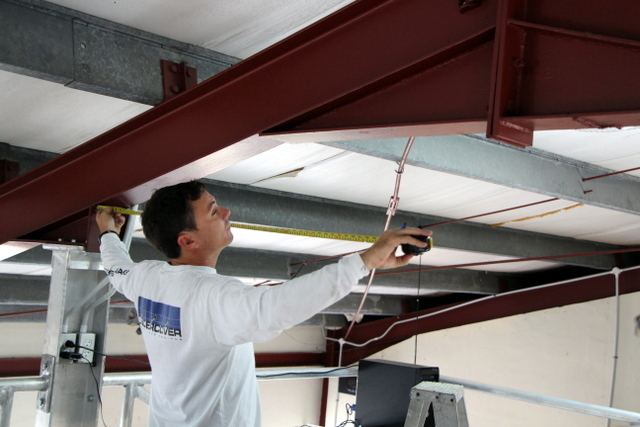 Tony and Nigel took measurements from the steel frames they erected earlier in the month for the fabric structure. 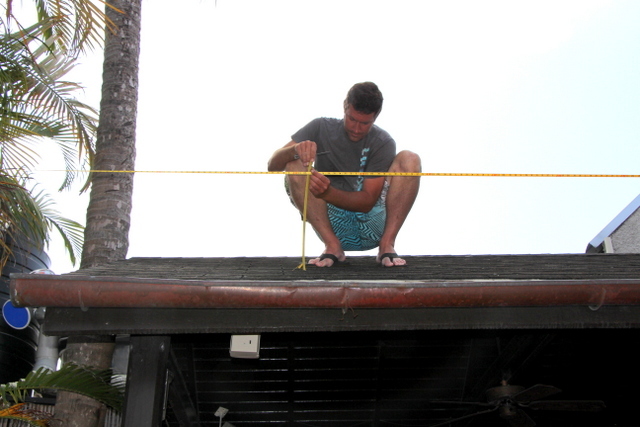 We will use these measurements to design their Signature awning in Sketchup. 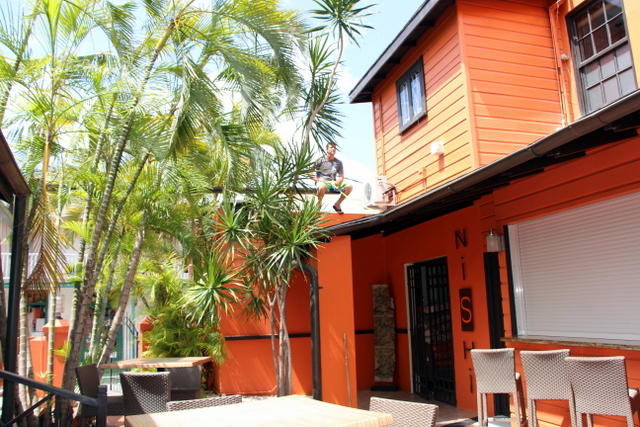 Taking field measurements at a local sushi restaurant for an Undercover Canvas Signature Awning. 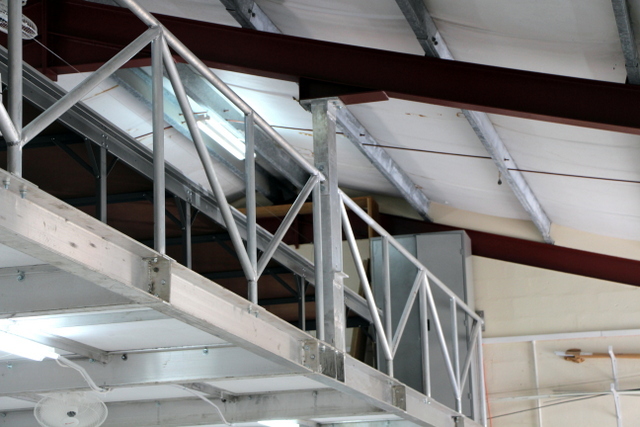 Steel frames were set earlier in the month. 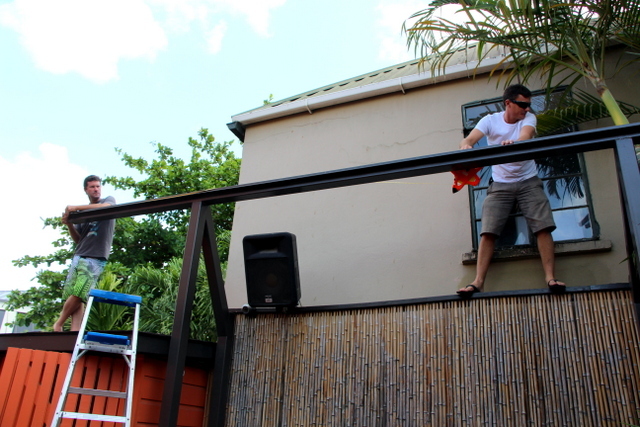 Nigel and Tony climb across fences and roofs to take accurate measurements for the fabric structure. 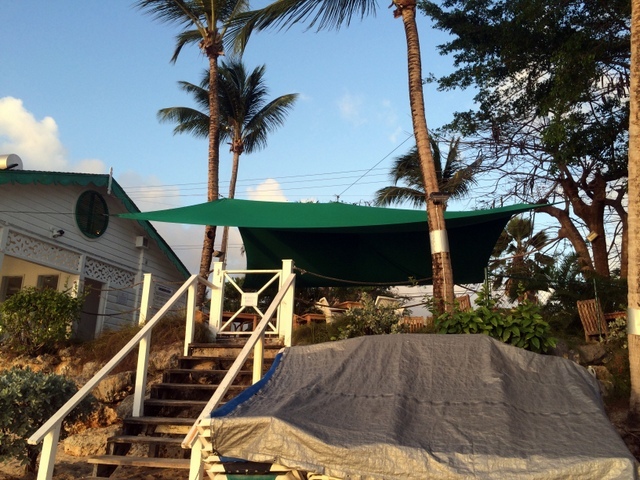 We were able to draw this 20’x24′ custom-designed awning structure in 1.5 hours. 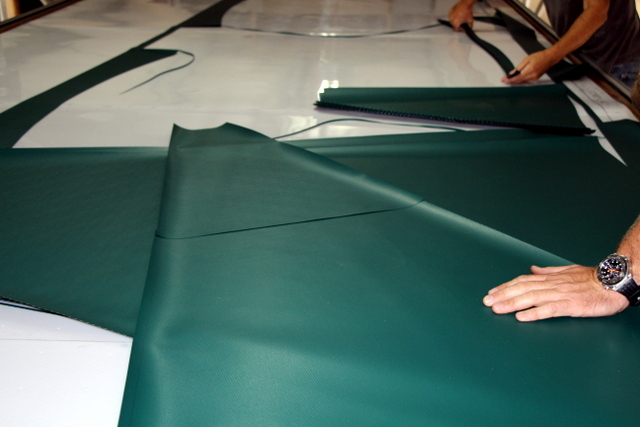 The four panels in the pattern each take 5 minutes to cut. What would have taken 2-3 guys 4 days can now be built by one in one day. These projects are just a glimpse at the lessons learned over the course of the install. If you’d like to see more pictures of the lofted table, how they installed their system, or a few glimpses of life on the island, please scroll down. 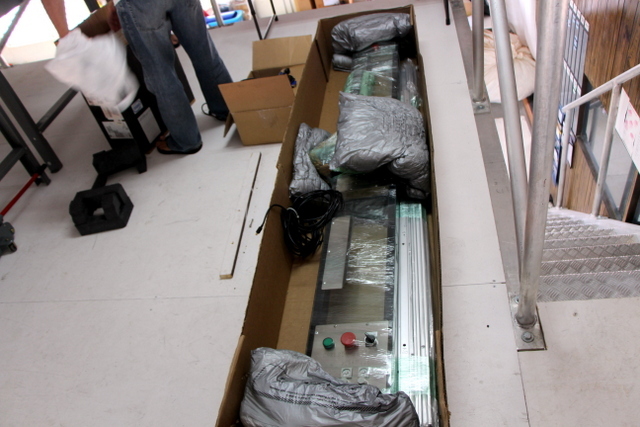 They setup their table before we arrived, which allowed us to begin training on the first day of the install. They setup the vacuum table before we arrived. 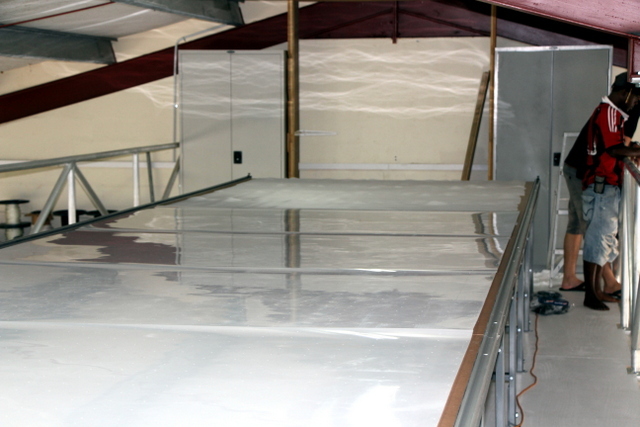 This meant we were able to start training on the first day of the install! We made sure their table was level and square before installing our track. 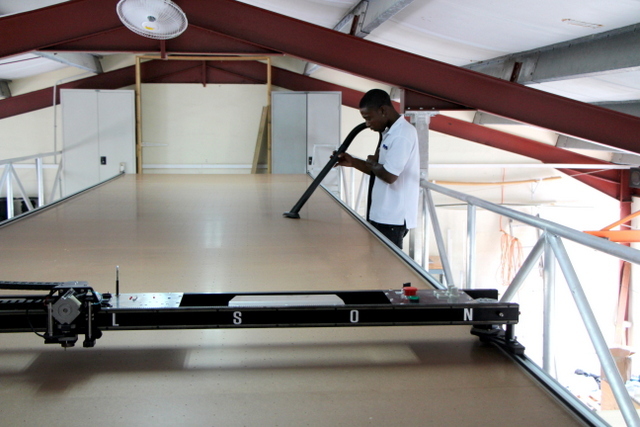 Using a floor jack, we quickly eliminated any high and low spots. They already unpacked their pallet to inspect for shipping damage before we arrived. Save this box and padding — the plotter/cutter can be shipped via UPS or FedEx in this box if you ever need serious service (which is rare). Everything looks great! Time to get to work. Layout the track according to the manual’s track layout diagram. Insert and Loctite steel pins. 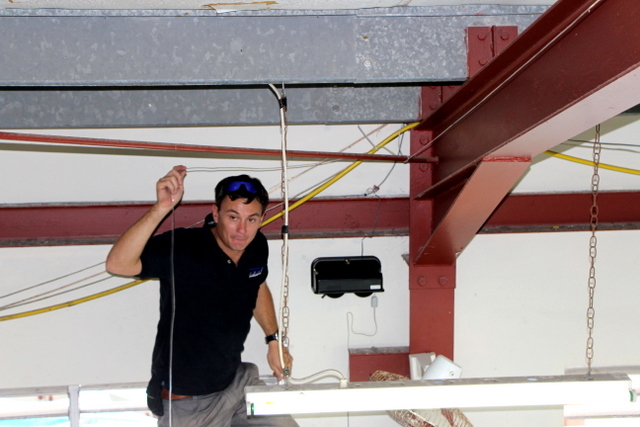 Paul is helping zip-tie the control, air, and power cables together. 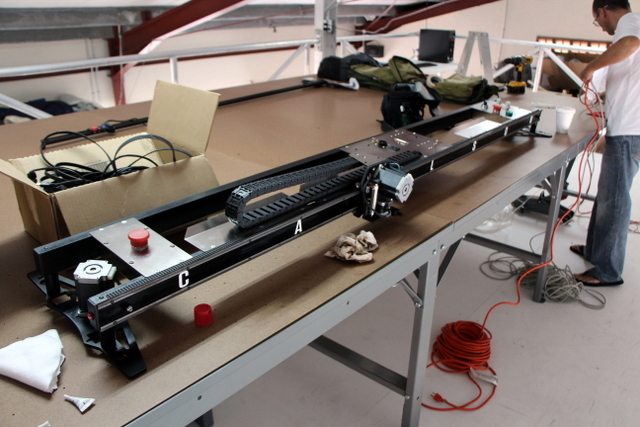 Nigel is measuring off-center of the eye beam above the table to attach an eye-hook for the over-head cabling. Over-head cabling eye-hook and 3/32″ cable. 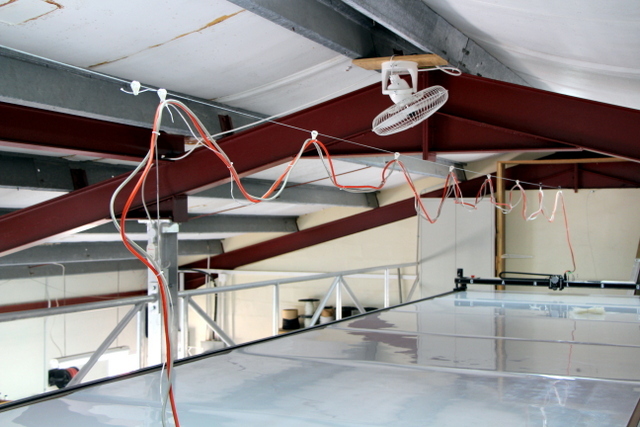 The over head cabling runs on high quality Harken pulleys or sail slides. 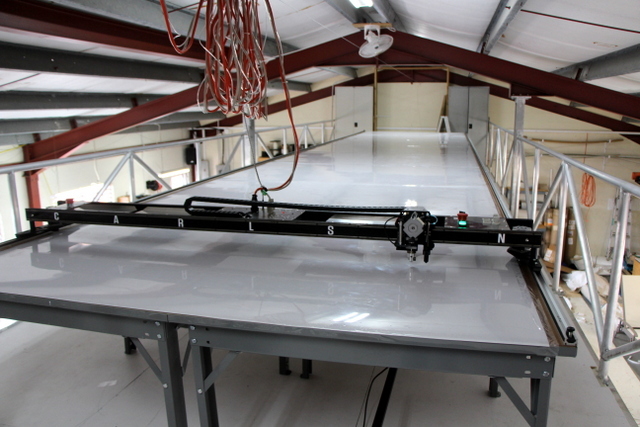 You can also side-mount your cabling OR run it in a cat-track. Nigel is running the airline to his existing air compressor. We provide a quick release and 1/4-20 NPT for easy hookup. Min air requirements are 90PSI @ 1 CFM. They also attached the plumbing before we arrived! 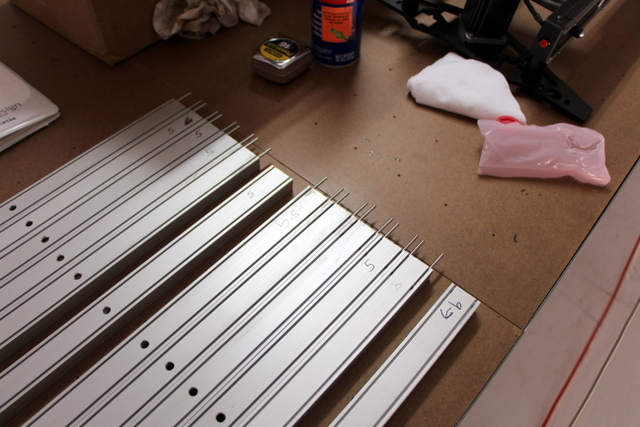 Silicone the flanges to the table and attach with #8 screws. PVC glue the vertical fittings and PRESS FIT the horizontal connections. 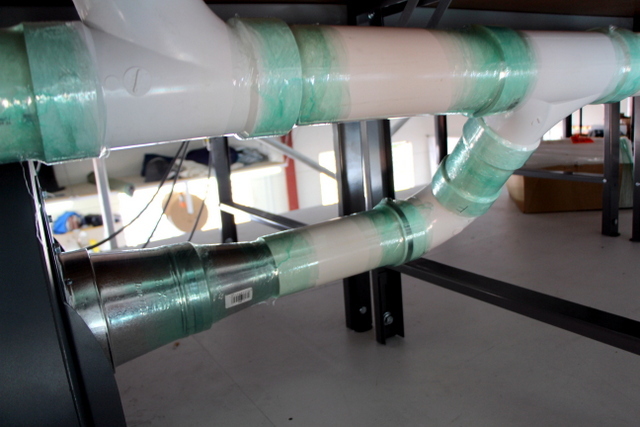 We wrapped all the horizontal connections with stretch wrap to prevent leaks. Attach side A as straight as possible. Pilot drill each hole AND hand screw the #10 screws to prevent over tightening. It’s a little easier and faster to attach tape and belt to side A before setting up side B. 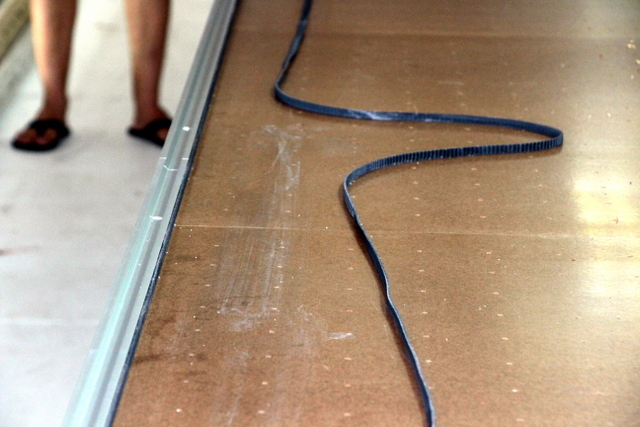 The belt needs to be thoroughly wiped with acetone or sand paper before it is attached with double sided tape. 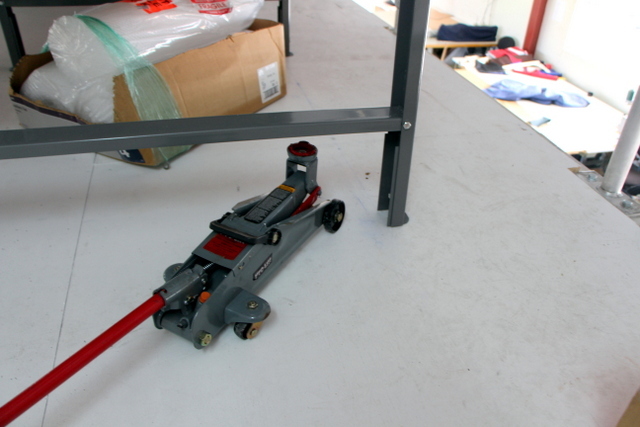 Place trolleys in the track, and make sure they are properly adjusted before attaching side B. Center the trolleys on both side A and B’s X-Drive plate. Tighten. 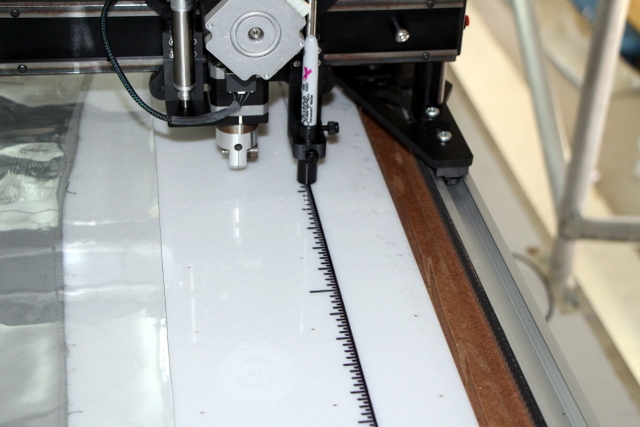 Use the plotter/cutter as a jig to square Side B. Slowly push it just past the next track hole and secure. Continually check square. Continue until Side A and B are secure. 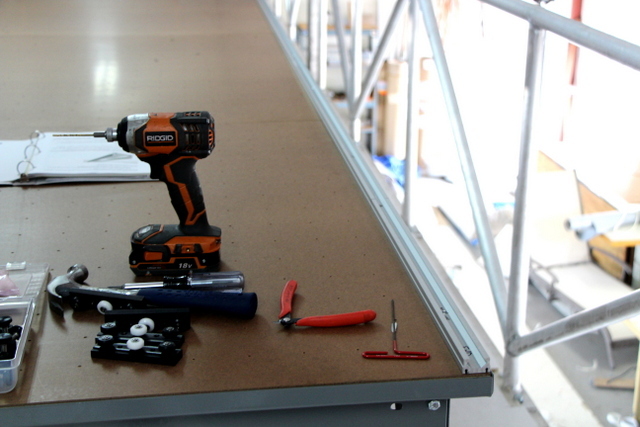 Do not stop half-way through as the track can be damaged if it falls off the table during this phase. Clean off any install debris. Cover the table in breather mesh. 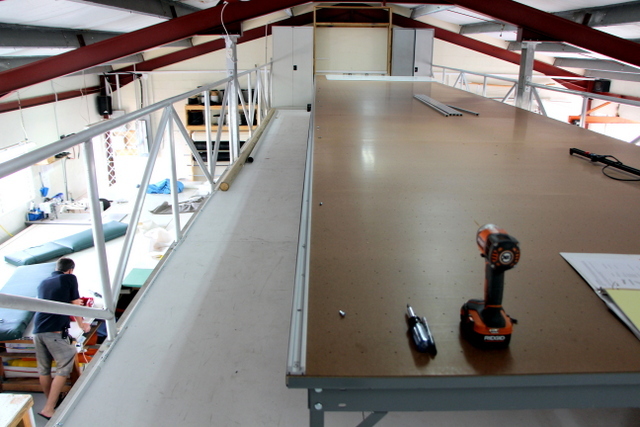 Place 4″ in from the outside edge of the table on each side. 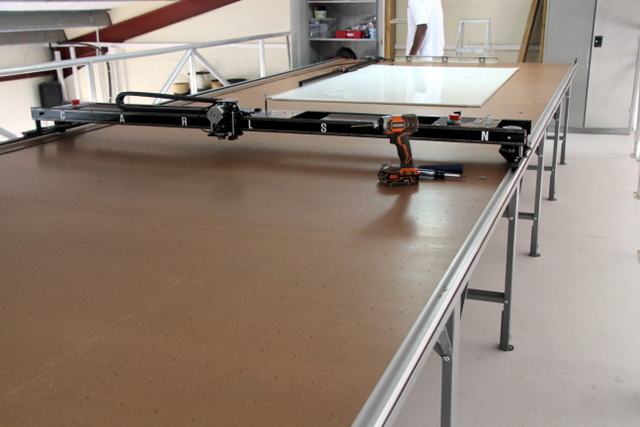 The mesh creates a vacuum channel between your table top and cutting surface. 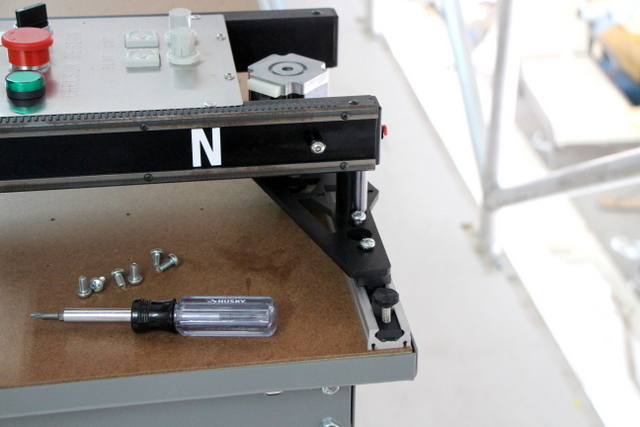 This way your holes do not need to perfectly align and you can easily flip the plastic to extend cutting surface life. Secure the cutting surface with packing tape. 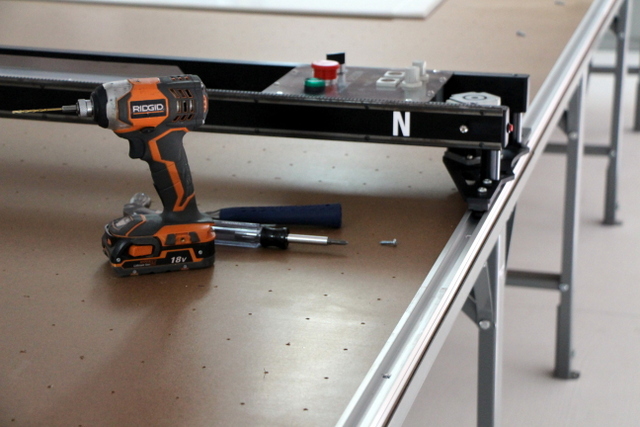 Do NOT glue, caulk, double side tape, screw, or otherwise fasten the cutting surface to the table. 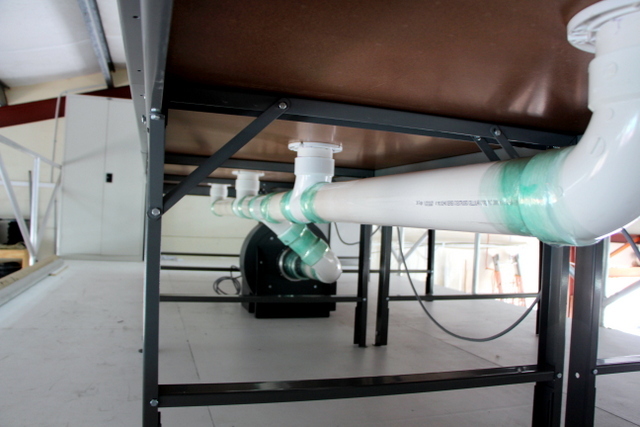 The HDPE will expand in the heat and bubble or warp if permanently secured. Setup computer workstation. They are using a folding table until they have a better understanding of their work flow and switch to a more permanent solution. 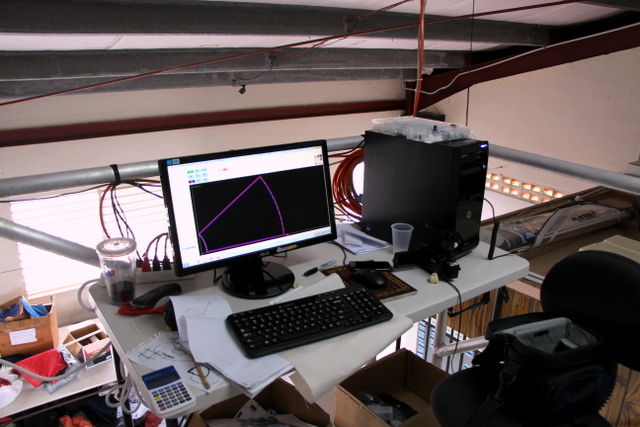 We provided a preloaded and tested PC and Nigel provided the monitor. 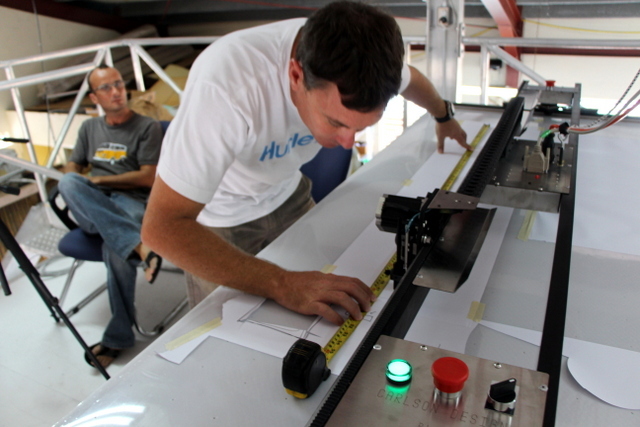 Once the plotter/cutter is installed, it must be calibrated. 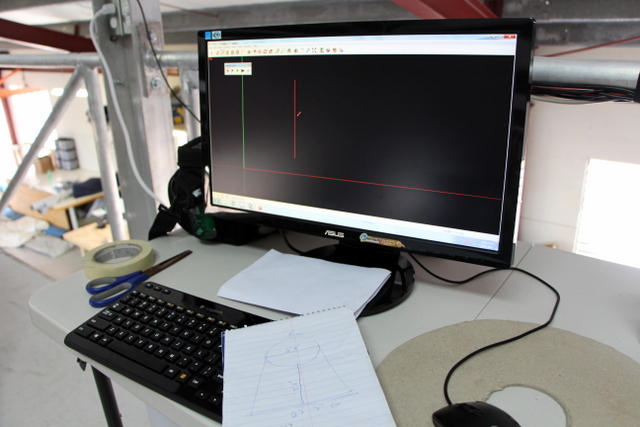 In the configure tab, draw and measure a line in the X and Y axis. Measure that line and tell Plotmaster the actual value. 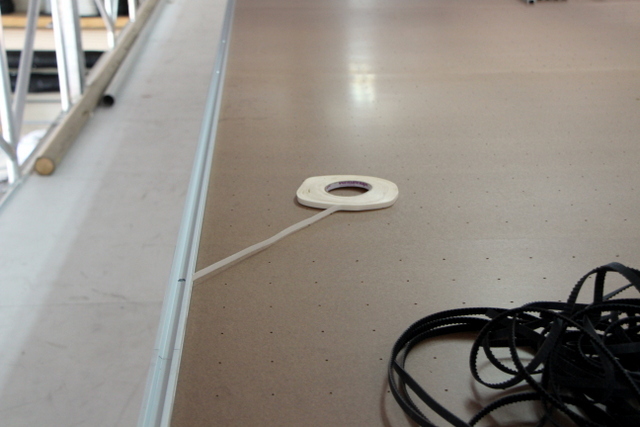 Add a measuring tape and alignment mark to the edge of the table to make it easier to align your material. 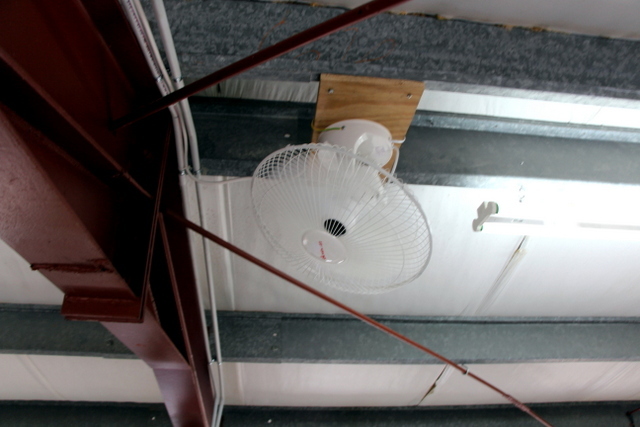 Fans in the loft help keep temperatures cool in the summer. 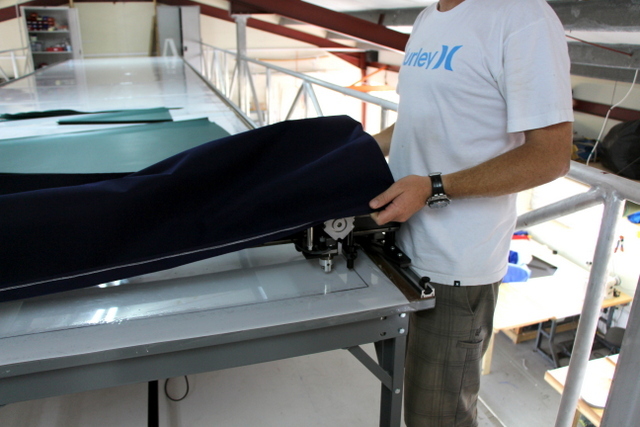 The plotter/cutter gets tucked in under its custom cover at night. 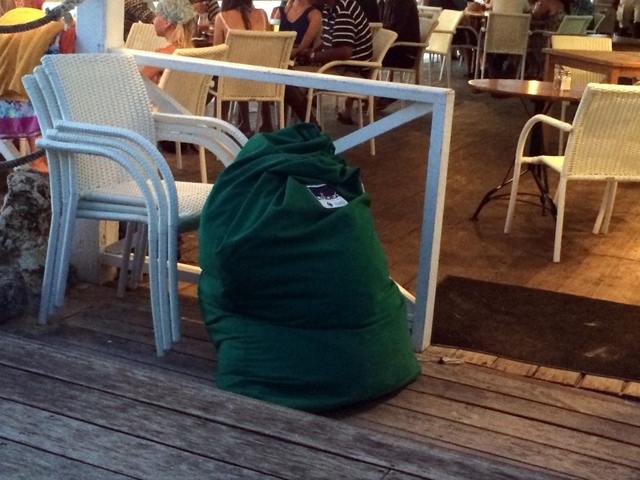 Beachside view of an undercover shade. It’s lowered nightly to prevent it from being considered a “permanent structure”. Tom riding to lunch “Batian” style. A long days work is rewarded with a beautiful sunset. 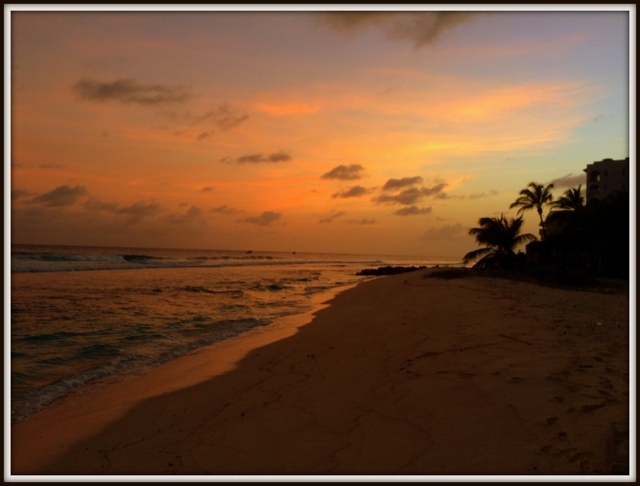 Goodnight Barbados! 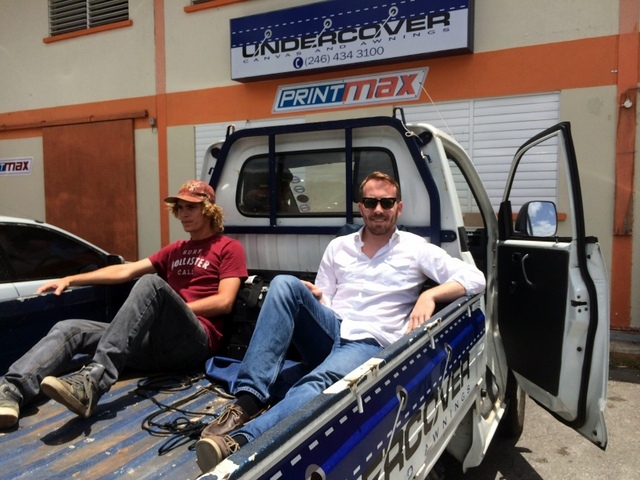 Big thanks to Jess, Nigel, Tony, and the rest of the Undercover Canvas team for a great install, fun trip, and new good friends. We look forward to seeing your next big projects!